Acoustics is the branch of physics that deals with the study of sound. Acoustics is also the influence a space has on sound from the source. Noise consists of vibrations that move through a secondary in a medium (solids, liquids or gases). In most cases that is air, that we can hear as humans. If in a room, through the air, sound from the source arrives at a hard surface such as a wall, window, ceiling, floor or an object a (large) part of the sound is reflected back by reflection. Depending on the hardness and smoothness of the reflecting surface, there is a lot or a little reflection. Read more. When there is an intensive reverberation in a room we speak of “poor acoustics”. If we were to stand in a large concrete bunker of 10x10x10 meter it would be almost impossible to have an understandable conversation due to reverberation. Another example is the reverberation in a large empty church. If we clap our hands in an empty church, the reverberation takes several seconds. Once the church is filled with people the reverberation is shortened. This is because people and their clothing absorb vibrations of airwaves. Because of this a large amount of noise is no longer reflected. The same reverberation that makes a good conversation practically impossible makes a choir sound beautiful. Read more. Hoe verbeteren we de akoestiek! To improve the acoustics in a room we usually have to handle the reverberation. The point is that the original sound reaches our hearing from the source, while minimising reflections with any remaining reverbation in the room is as short as possible. No reverbation at all makes the space sound “dead” and “small”. Speaking can then be tiring because we have to use a lot of volume, as it will depend on whether we are conducting a conversation (situation is ideal) or are in a room with hundreds of people where we need a sound system to make us audible everywhere. There should be a healthy balance. To achieve this we should reduce reflections. Read more. U kunt ook direct de akoestische lampen bestellen in onze online webshop. 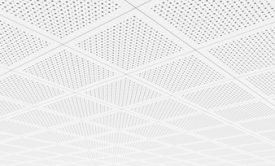 If it is not possible to resolve with the possibilities as described before there are acoustically absorbent products, such as sound absorbing wall and ceiling coverings. Available in a wide variety of sizes and colours. Dependent how the room is used these can be applied. It is recommended to immediately call in an expert in new buildings to avoid a lot of problems afterwards. Sufficient and adequate possibilities in an existing space with poor acoustics are available. For the approach of your acoustics problem it is vital to correctly map the complaints. It is also useful to advance a measurement in which the reverberation time is recorded. An interview with the residents/employees concerned underlines the problems/annoyances. As a result of this an action plan can be set out. In many cases it may be possible to eliminate the reverberation directly at the source of the sound. If we can avoid the existing reverberation from reaching our hearing, the room will also sound different. For example: you are trying to have a conversation with someone in a very large empty concrete space. This is virtually impossible due to too long reverberation. When you now sit down in a seat which is shaped like half an egg, with on the inside absorption material, a large part of the reverberation will not reach your hearing. This is because the outside of the seat doesn’t let sound pass through and because the inside absorbs reflections. This example makes it clear when reverberation can not reach your hearing and you therefore almost only hear the source, good acoustics can be generated. 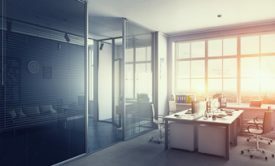 It is therefore possible to drastically improve your workplace by providing the right products when it comes to acoustics. Solutions that improve your acoustics. Villa ProCtrl, known as the brand for lecterns and iPad stands, are passionate about AV Media. Acoustics is a part were extensive experience has been gained. In the past few years studios, living rooms, offices and retail shops received advice or materials to make it soundproof or to improve acoustics. 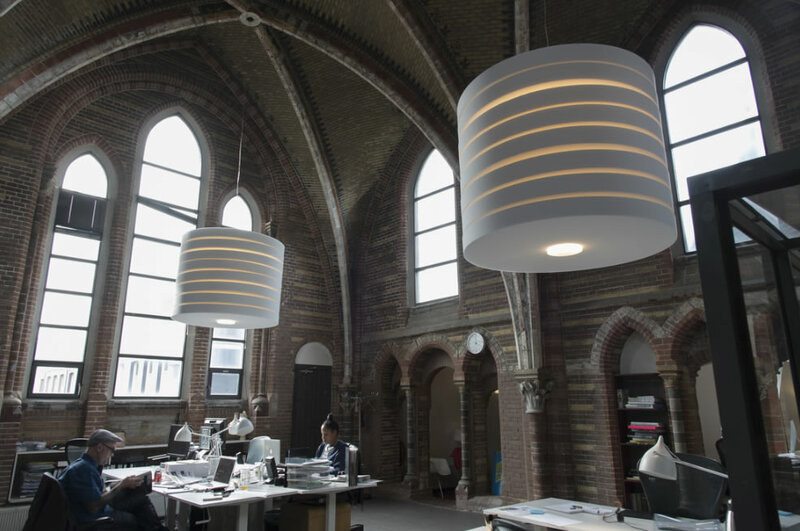 Villa ProCtrl would like to put the acoustic lamps by knapontwerp into the spotlight. 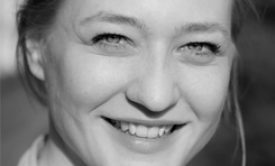 Designer Tjimkje studied at the Minerva Art Academy in Groningen and specialised herself in the development of acoustic products through her company knapontwerp. She was in technical, in acoustic perspective, guided by the collaboration with Post Acoustics. The cooperation between the two led to a wonderful collection of acoustic lamps. Luut Groenhof, commercial director of Villa ProCtrl, but also a designer and sound engineer, discovered this collection of acoustic lamps. He was instantly convinced of the applicability. Besides the fact that the acoustic lamps can absorb a lot of reverberation, they are aesthetically beautiful to look at. Because of the open structure and rough finish of many houses and offices the demand for acoustic products have increased strongly. The lamps have the open-cell surface of Basotect. The sound energy is reduced in the cell structure, giving Basotect an excellent sound absorption capacity. This patented melamine resin foam has the highest sound absorption capacity in the market. As such it is no wonder that all the acoustic lamps are made from Basotect. 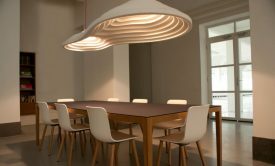 The entire collection acoustic lamps is supplied by Villa ProCtrl. Either directly to the end user or via the architect for example. Villa ProCtrl offers not only the delivery of the acoustic products, but also the entire process of advice and noise measurements in cooperation with specialised companies including Post Acoustics. Application of the acoustic lamps. As described in the previous article the acoustics can be further improved in a number of ways. The acoustic lamps not only have the benefit that they improve acoustics but also ensure good (work)light and are real eye-catchers in terms of design. Dependent on the space in application and size there is a wide choice within the collection lamps. There are small lamps, like the model Retro with a diameter of 90 centimeters, to large lamps for above a conference table or a workbench such as the Rice Field with the large size of 120×240 centimeters. Because the lamps are installed directly above the work station, it will have an immediate effect on obtaining better acoustics. All acoustic lamps are able to combine in the most effective manner with the best and most modern LED lightning that contributes to a better indoor working and living environment. The lamps will be mounted and connected in consultation. Your lightning in place with fluorescent systems can be converted with the acoustic luminaires. The conversion of acoustic melamine resin foam is custom made and can be at request arranged either vertically or horizontally in relation to your fluorescent lightning. The entire collection of acoustic lamps is on our website with photographs and technical specifications. You can purchase the acoustic lamps online now in our webshop.